Where I can I avoid credit. It's funny to think back and remember that I actually used to be a saver. I saved up to go to University by working two jobs the whole of Summer 1991. I didn't get any financial help from my Mum or Step Dad and luckily back then we still had Student Grants which covered fees AND subsistence. I didn't even get a student loan until the final year so I had that paid off within a year or two of finishing University. Plus in my last couple of years of Uni I had part-time jobs there which helped. One, in a theatre bar and then later in the town's night club on the entrance desk. I only got a credit card because a gang of us at work (after Uni) were going to Magaluf! Yeah don't ask! I was worried I wouldn't have enough spending money after paying for the flights and accommodation. The card actually arrived in the post AFTER I got back so I should have cut it up and thrown it away - hindsight is a wonderful thing. But I kept it and used it. It wasn't my last one either as I fell into that trap of doing balance transfers for 0% interest on the existing balance as they did back then. At my 2nd job after Uni me and my deputy used to regular go out for lunch or dinner and if it was that part of the month when finances were low, it always went on the card. That stereotypical thing of a credit card funding a lifestyle you can't afford. We used to do yoga together every Wednesday and always went to Wagamamas every week afterwards. How very extravagant. It was fine for her as she still lived at home and had no overheads. I'd give myself a good talking to if I had a time machine. 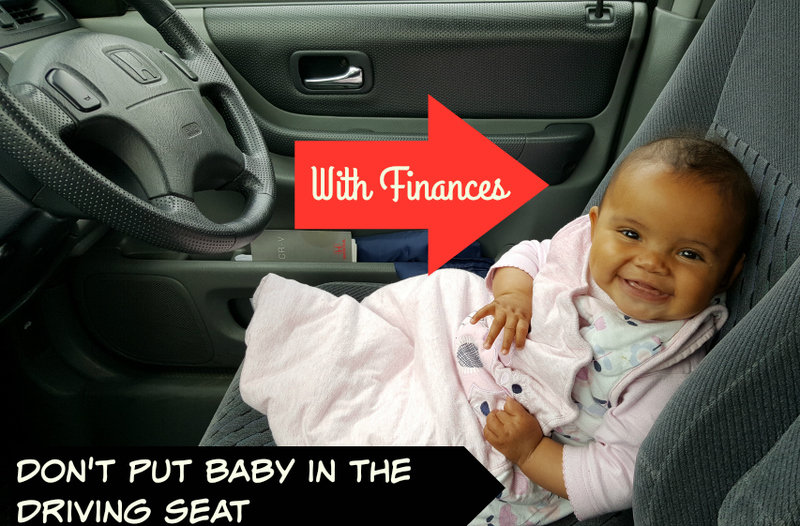 Anyway I've said several times on this blog how I cleared my loans and credit cards prior to getting pregnant as that gave me the feeling of financial security I needed to be a Mum. So now, I only spend what I have and it's a good feeling. We shop in Aldi and it makes the weekly food shop affordable. I completely dropped top-up shops by ensuring that our weekly food shop contains those items. So I get enough bread and milk to last 7 days and I purchase Aaron's after school snacks with the groceries to avoid expensive trips to sweet shops after school. I breastfeed which saves us money on formula. I'm reviewing lots of baby food which saves us money again now she's on solids (still breastfeeding LOTS though). I try and say yes to those blogging opportunities that save me a purchase. Freshest example being our recent photo shoot with Regatta Outdoors which meant Aaron, myself and Lottie all have coats for the Winter now, plus they both have hats and Aaron has wellies. Also, of course, we had our photo shoot with the Gro Company which means Lottie has 3 new Gro Bags for Autumn Winter. They're gorgeous Orla Kiely ones and I am so proud of Lottie for modelling them. I need to do a whole blog post about it soon. I'm not too snobby or snooty to accept pre-loved bits and pieces for Lottie and this has saved us heaps. Unfortunately we had the huge expense of the pram but hopefully I will get chance to recoup it. We kept all of Aaron's bits and pieces meaning Lottie already had a cot, a Fisherprice Jumperoo, a Baby Einstein activity gym mat and a Lindam Door bouncer amongst other things. I do all of Aaron's haircuts myself even cutting it as recently as last night. Children's haircuts here are £10 so that saves me £10 a month. I haven't had mine cut in well over a year and just bung it back in a ponytail or Mum top knot. I purchased Aaron's school uniform in July when Aldi had it on Special Buys. This saved heaps. A lovely lady from our PTA sewed on the school logos for me. I'd love to say we save money on holidays by travel blogging but alas Bluestone was April 2015 and too long ago. So holidays have been non existent but hopefully I can do something about that in the future. We walk to school which saves us heaps on bus fare. We get the bus once in a blue moon. Most meals out have been blogging related and take aways were taken away ha ha. Although the hubby did treat us to a Chinese in honour of his birthday week. He was modest this year he normally has a birthday month! Days out in school holidays are usually blogging related too like our recent trip to Kidtropolis. You can also get discount codes via dealsdaddy or dealsqueen so save money every time you shop online. Simply search for your retailer or for Deals Queen just click on the featured retailer that catches your eye; then you can get a code or get a deal. My vice though is always coffee. I always buy a Latte or Cappuccino when out and really must put a stop to this. If I knew what it added up to I probably would have done already. And finally remember, babies don't need nearly as much "stuff" as we think they do. Any conversation about finances at this time of year though, has to mention Christmas. It's like a big expense looming on the horizon. Last year Aaron wanted a tablet and we got the Kindle Fire (from Santa) from John Lewis and it was only £49 but I then pay about £3 a month for all of the kids' apps that come with it. I am glad as I tried to download games for him on my phone the other day and they all came with in-app purchases which frighten the hell out of me. He nearly bought a virtual basket of gems for £14.99. Why do these games do this when they should know it's not fair on parents. Luckily with the apps that come on the tablet there's none of that so I have no worries and they're all age appropriate. He's starting to find some of them baby-ish so it was the right gift for last year and he does still play with it, but it wouldn't be the right purchase this Christmas. I'd like to get through Christmas without accruing any debt. Having spoken to all of the Mums at school they're all in a Christmas club where they pay in every week, funnily enough to our lollipop lady. I could never do that as I remember one or two of them going bust a few years back and I can't get that out of my head even if this one is safe, but the idea of saving for Christmas a little bit all year does appeal to me. Friends online are completing surveys to make money in exchange for vouchers that they can use for Christmas shopping. I really need to join in on this one but haven't had the time thus far. Never too late though must make an effort this week. Also in my blogging life I need to get better at pitching. I need to treat blogging as work instead of as a hobby. That shift took place for most people a couple of years ago. I think I am a bit of a dinosaur. It's a shame, I peaked too soon. I was up to 3k page views a day a couple of years ago, but hadn't even monetised my blog at the time. What a missed opportunity. Back to the subject of finances though, have you seen all of the new ways to pay? There's new payment technologies which are discussed over on Money Life. I love the sound of the Bitcoin but I think I am too traditional and like my cash. In Bristol we even have the Bristol Pound. Traditional money mustn't completely be on the way out though as they have just released the new £5 notes. I don't know about you but I really really like them! What are your plans to get through Christmas? I hope Aaron wants something affordable from Santa again ha ha!